Nibali vs. Froome: Misunderstanding or breach of etiquette? Vincenzo Nibali made his race-winning move when yellow jersey Chris Froome was stopped with a mechanical in stage 19 of the Tour. 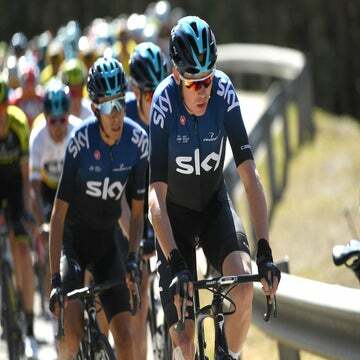 LA TOUSSUIRE-LES SYBELLES, France (VN) — Chris Froome and Vincenzo Nibali butted heads once again Friday, after the Italian of team Astana won the summit finish to La Toussuire. Nibali won stage 19 Friday with an attack on the Croix-de-Fer climb, 59 kilometers from the finish. His attack, though, came at the time that Sky’s captain in the yellow jersey had an issue with his back wheel. He stopped and fixed it, but when the TV cameras switched back to the main group, Nibali was gone. “In my opinion, it’s very unsportsmanlike,” Froome said. “Nibali had the whole time to attack, but he chose the moment when I had a mechanical to make his move. I heard from the other riders that he turned and saw me when he made his attack. The rider known as ‘The Shark’ by fans in Italy continued solo, passed Frenchman Pierre Rolland (Europcar) and crossed the line 44 seconds ahead of Nairo Quintana (Movistar) and 1:14 ahead of Froome in third. With his move, he now sits fourth in the overall. Froome leads by 2:38 on Quintana, 5:25 on Quintana’s Movistar teammate Alejandro Valverde and 6:44 on Nibali. As soon as Froome crossed the finish line, he found Nibali in the media mixed zone. “I don’t deserve the words he said; they are too hard, and not right to say,” Nibali explained later. “I won’t repeat what he said to me. “He was very upset with me and I don’t understand his problem. I didn’t hear any info on race radio. I just kept moving and going for the win. “I didn’t even respond to Froome when he came to me. It is not the first time that Froome became upset with Nibali. After a crash in the first week to Le Havre, Nibali yelled at Froome on the finishing straight and accused him of causing it. Froome rode directly to Astana’s team bus afterward and argued with Nibali, who soon apologized. On Friday, it was a bit of tarmac that provoked the confrontation when it jammed itself between Froome’s rear wheel and his brakes. Astana said that it did not radio from the car to tell Nibali to attack in that moment that Froome had his trouble. The team argued that it did not make an impact on Froome because Nibali was far down in the overall standings. Froome said otherwise. “I wouldn’t have said it was an attack specifically on the yellow jersey at that moment in the race, but if he attacked, for sure guys like Contador, Valverde, they’re going to start worrying about their podium places,” Froome added. The incident soiled moment of celebration in an otherwise black tour for Nibali. After winning the 2014 Tour, he hoped to come back and do so again. However, he suffered during the first week and on the first summit finish, lost many more minutes.